Jerry Jones is really starting to lean into his late-career Al Davis incarnation. Jerruh aka Skeletor, and Arthur aka Scooby-Doo Villain's teams play Sunday in Atlanta. I’m almost as excited for the pregame handshake shade as I am the game. And with Dak Prescott taking snaps without his best weapon, on short notice, the Falcons should be able to pull off the win at home in their dome. But we don't trust the Dirty Birds this season, so we'll take the Cowboys +3, still we'd love to be wrong and see the Falcons rise up. LeBron James is in his FIFTEENTH season in the NBA. LeBron James is currently averaging 30 points on 60% shooting, 7 rebounds, 9 assists, 1.5 blocks and 1.2 steals per game. The Cleveland Cavaliers, as a team, particularly defensively, look absolutely terrible. But we don't expect that to last. And the KANG is still KING, until somebody knocks him off his throne. And yes, we know he’s enrolled his kids in L.A. schools already, but that Laker team is gonna be sorry. If Bron is going to leave and trying to win, after a season in which it’s gonna be tough to do so in C-Town…why not consider a one-year deal to play in Philly, to see if Joel Embiid, Ben Simmons, Markelle Fultz, Dario Saric and Robert Covington could form a wave to overtake Golden State, while winning a title in a city that hasn’t won since Doctor J? Just sayin. Someone tell these colleges to stop sending these unpaid amateur athletes over to China for basketball exhibitions. Did UCLA learn nothing from the Georgetown debacle a few years back? Now the middle, most mediocre prospect of the three Big Baller Brand sons, LiAngelo Ball, along with two other teammates, are fending off an international incident on a shoplifting charge that could land them in a Claire Danes-Brokedown-Palace nightmarish locked-up-in-Asia scenario. And Stephon Marbury, Chinese Basketball Legend, last seen in America during the summer of 2009, shirtless, eating Vaseline on a live stream, while getting a shoulder massage as he wept with Kirk Franklin music playing in the background. Fast-forward to the middle of this decade, and “Commissioner Ma”, as Marbury is now known in Beijing, is a legendary champion, getting his own statue outside a Chinese museum dedicated to his hooping exploits and team leadership abilities. Perhaps that’s why former BYU star/Sacramento King bust Jimmer Fredette seemed to back off a potential scuffle with Steph while in his stomping grounds. Did you know The Jimmer was playing in China before this? The moral of the story is mind your p’s-and-q’s in Chairmen Mao’s town, my dudes. Here’s wishing Liangelo & Co get back stateside safely ASAP. We hope Gelo can find a gig hooping in Greece or Spain after UCLA, because he can’t go back to China, nor should any NCAA program. We told you on Monday that the 2017 Eagles make us relax. Watching their games stress me out worse than a Chip Kelly offseason. Don’t get me wrong, I thank the Basketball Gods every day that Joel Embiid is healthy enough to play. And Ben Simmons is a gift that was well worth the wait and keeps on giving. Speaking of Ben Simmons, he had some interesting stuff to say about the American collegiate basketball system in a sit-down conversation with Maverick Carter. Did we mention Ben is with Klutch Sports, the agency founded by Rich Paul, close friend/business partner of LeBron James? Just sayin. The Sixers will be playing in the Oracle Arena against the reigning champion Golden State Warriors on Saturday night. That has “learning experience loss” written all over it. They should be heading into Oakland riding a six-game winning streak. But instead, they lost, no blew, another game in the final minute. That's their fourth such game, eleven games into the season. We’re not sure why Brett Brown didn’t use a timeout in the final 15 seconds. The Sixers are the top team in efficiency coming out of timeouts in the NBA, while their extremely young core has only played together in ten NBA games. But maybe Brett’s trying to build some trust and independence in them early, to help them later on, since an 82-game-season-plus-postseason isn't a sprint but a marathon. All that being said, we trust the process to cover a 14 ½ point spread out West. For the first time in this century, Miami plays Notre Dame for big stakes, in this weekend’s premier collegiate football game. We’ve been gearing up for this one. Watched a re-run of the Catholics-vs-Convicts ESPN 30-for-30. -Authentic animosity between teams and fanbases. -Players with personality that you knew. -A chance things could descend into chaos like the brawl before the ’88 game. 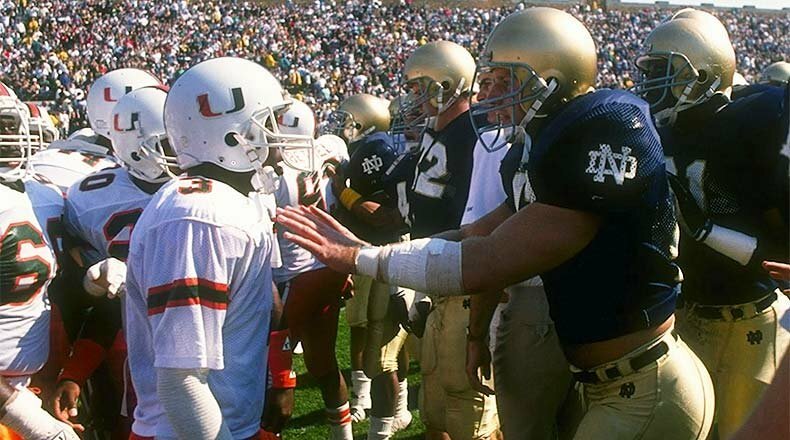 This is not your father’s, or even older cousin’s, The U vs. Notre Dame. That being said, it’s a big one all the same. While we’d love to pick Miami, they’re gonna need to stop ND’s rushing attack, with CFB’s best offensive-line and have at least three players rock the “turnover chain”, to win this game. That’s too many variables necessary for us to feel good picking against Notre Dame, giving only three vs. the home-dawg Canes. Why is Colorado, or Utah for that matter, but especially Colorado, even in the Pac-12, which should still be the Pac-10? What value has either program added since they were allowed to hop in? I won’t bore you with analysis on this one. Colorado is sorry, per usual. USC has responded to another preseason-hype season, after a surprisingly good finish in the prior year during the post-Carroll era, with a disappointing campaign. But if they can’t cover 13.5 in Boulder during an early afternoon game? They might as well not even fly back on that DEN-to-LAX plane. Historically the program pedigrees may not add up to Miami/Notre Dame, but it could very easily be argued that Georgia at Auburn is a better matchup. This is the kind of game that Georgia would regularly lose when now-Miami-coach Marc Richt was at the helm. Have the DAWGS shaken off those big-game fleas under former Bama DC Kirby Smart? Maybe so, maybe not. We’ll take the Tigers and two-and-a-half at home. Speaking of home dawgs, we know the Saints are supposed to be good again, but good enough to be a Southeastern Dome team with no D and a 39-year-old QB, giving three points on a cold day on the frozen turf up in Buffalo? We say no. Enjoy your weekend, we’ll be back next week with a musical tribute treat, plus our obligatory preview heading into DALLAS WEEK. Last, but certainly never least, we’d like to dedicate this edition of Wudder Sports to a class-act, future Hall of Famer, Phillies and Blue Jays legend that we lost four days ago, the one-and-only Roy “Doc” Halladay. I don’t think I can add much that hasn’t already been said by teammates, loved ones or in tributes already authored by others this week. But on this Veteran’s Day, we’d like to thank him for a different kind of service.